Hurriyat (M) Chairman Mirwaiz Umar Farooq on Friday stressed that the problem in Kashmir was not administrative in nature related to roads, inaugurating of tunnels, power projects or jobs, that it can be addressed thus nor was it a law and order issue to be handled by repression but it is a dispute directly linked to the political future of tens of millions of citizens of Jammu and Kashmir and it needs to be resolved as per the will and aspirations of these people. 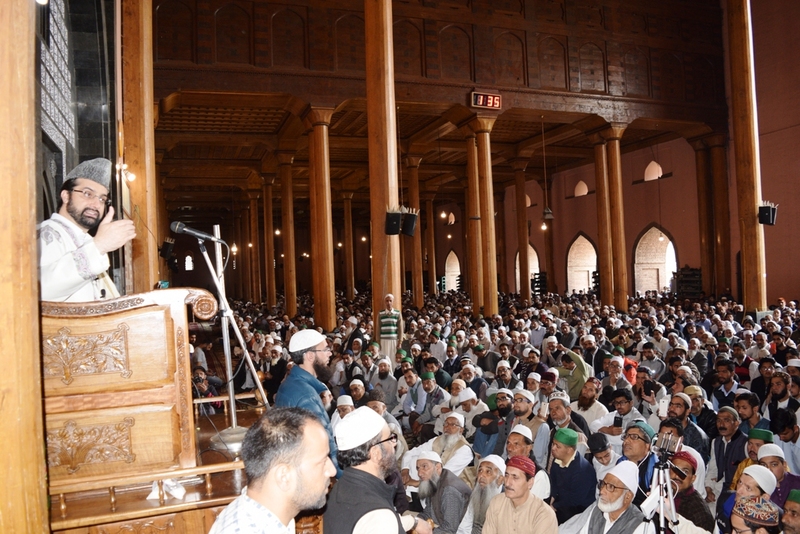 Addressing a mammoth gathering at the historic Jamia Masjid on the occasion of first Friday of fasting month of Ramadan, Mirwaiz said that Prime Minister Narendera Modi who is coming to Jammu and Kashmir tomorrow, reaches out to the people of India in a novel way by saying his “Man ki baat,” we the peace loving people of Kashmir want him to also give us this chance to say our “man ki baat” to him peacefully at Lal Chowk Srinagar tomorrow. Our “man ki baat” is just three words—Resolve Kashmir Dispute. Mirwaiz said that people of Kashmir want the fulfilment of the promise made by the predecessors of PM Modi not only in Lal Chowk but in the Indian parliament. Terming May 21, 1990, blackest day of Kashmir history, Mirwaiz said on this day under a deep conspiracy, People of Kashmir lost their beloved leader “Shaheed-e-Milat Moulana Muhammad Farooq” who would always raise his voice for justice for Kashmiris and fulfilment of their aspirations from the pulpit of Kashmir’s Central Masjid and everywhere. He said on the same day more than 60 innocent people were massacred at Hawal. Mirwaiz said just after a few years after this tragedy Kashmiri’s also lost another leader Shaheed-e-Hurriyat Abdul Gani Lone. Mirwaiz said that people of Kashmir continue to offer huge sacrifices since 1931 and in this process leadership too has offered the sacrifice of life. Mirwaiz strongly condemned the Israeli aggression in Gaza, Palestine where 60 innocent youth were killed. He questioned the criminal silence of the OIC and the heads of Muslim countries across the globe over the genocide of people in Gaza stating that Kashmiris can never remain silent over such brutal killings and will always stand for their Palestinian brethren in their quest for their rights to their land. Mirwaiz urged people to march towards Lal Chowk on May 19 where a peaceful sit-in will be obsessed while as leaders and people would hold placards to convey their message. He also urged people to assemble in Eidgah on May 21 for taking a pledge to take forward the mission of martyrs till it is achieved. After the prayers as per the JRL program, a peaceful protest was held against the massacre of Palestinians at the hands of Zionist Israeli forces and in support of the Palestinian demand for their homeland.